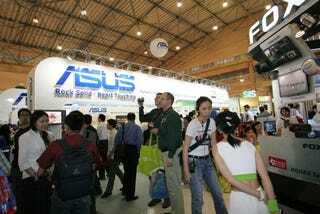 Asus is hoping to steal the show at Computex tomorrow, releasing not one, but two new Internet stereos. The flagship AIR 3 will be able to stream music from the Internet while also docking your iPod and doubling as a pair of external speakers. The stereo will sport a USB port for playing music off of flash drives (oddly, it won't play music from non-iPod MP3 players). Price-wise, it'll sell for $400, which is why we're leaning more toward the AIR 1, the AIR 3's younger sibling. In a nutshell, the AIR 1 ($200) will be a more compact version of the AIR 3 sans the iPod dock. Both stereos are expected to hit our shores just in time for the holidays. Compared with Sony's WA1, the AIR 3 is a little pricey for a streamer (even if it does play nice with your iPod) so we're hoping there's more to it than just Internet radio (like a decent amount of built-in storage, perhaps). (Note: this image is from last year's show).